Éclairs and cream puffs are one of my favorite desserts. 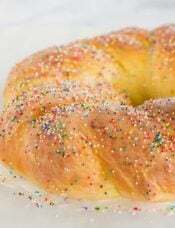 My mom used to go to a bakery and pick some up for me each time I would visit as a special treat. I am ashamed to say that I *may* have once thrown an adult temper tantrum when I realized that the number of éclairs I was planning to take back with me had diminished by a noticeable number and I was not the one who had eaten them. I’m serious about my desserts, folks! Since I had previously conquered pastry cream and made it a number of times since, I felt that it was finally the perfect time to master pâte à choux and whip up those delicious pastries that I love so much. 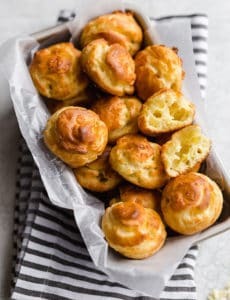 I had been intimidated by pâte à choux for quite a while, and had always shied away from trying it. It seemed so… delicate. So… fussy. Imagine my shock when I made it for the first time and found it to be… simple. Gorgeous puffs of dough emerged from the oven. No drama. Beginners luck, perhaps? I’m still not sure, but I’ve never encountered problems with the dough and have found the recipe and method I’m going to share with you to be virtually foolproof. Okay, you made the pastry cream – now it’s time to create the pastries! Once again, I am using the same recipe that was used when I first made éclairs and cream puffs, so if you’d like a commentary and photo-free recipe to print, I suggest heading over to that post. IMPORTANT NOTE: When I did this tutorial I was making cream puffs for an order, so I doubled the recipe. That’s why you may see twice as many ingredients in the pictures as what is called for in the recipe. This recipe makes enough for 24 cream puffs or 8 éclairs. 1. 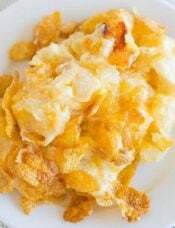 Beat the eggs and egg white in a measuring cup or small bowl; you should have 1/2 cup (discard the excess). Set aside. 2. 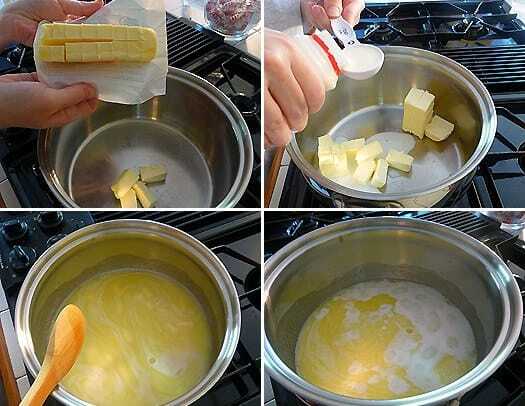 Bring the butter, milk, water, sugar, and salt to a boil in a small saucepan over medium heat, stirring once or twice. 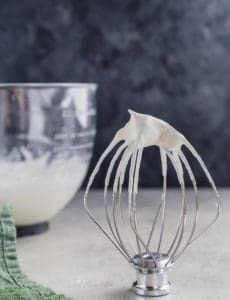 When the mixture reaches a full boil (the butter should be fully melted), immediately remove the saucepan from the heat and stir in the flour with a heatproof spatula or wooden spoon until combined and the mixture clears the sides of the pan. Return the saucepan to low heat and cook, stirring constantly, using a smearing motion, until the mixture is slightly shiny, looks like wet sand, and tiny beads of fat appear on the bottom of the saucepan, about 3 minutes (the paste should register 175 to 180 degrees on an instant-read thermometer). 3. 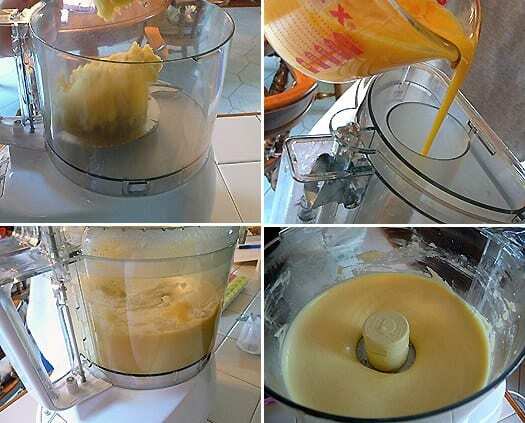 Immediately transfer the mixture to a food processor and process with the feed tube open for 10 seconds to cool slightly. With the machine running, gradually add the eggs in a steady stream. When all the eggs have been added, scrape down the sides of the bowl, then process for 30 seconds until a smooth, thick, sticky paste forms. 4. 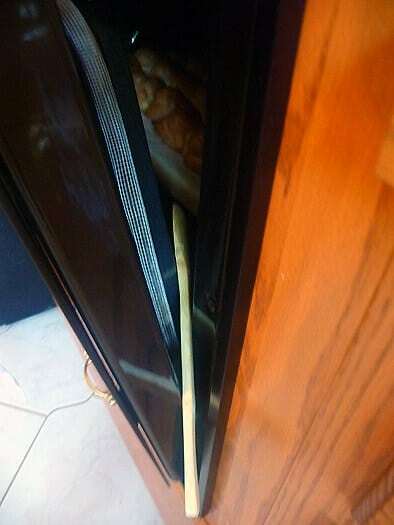 Adjust an oven rack to the middle position and heat the oven to 425 degrees. Spray a large (18 by 12-inch) baking sheet with nonstick cooking spray and line with parchment paper; set the pan aside. 5. Fold down the top 3 or 4 inches of a large pastry bag fitted with a 1/2-inch plain tip to form a cuff. [If you don’t have a 1/2-inch plain tip, you can cut a 1/2-inch hole off the bottom of a disposable pastry bag or large ziploc bag.] Hold the bag open with one hand in the cuff and fill the bag with the paste. Unfold the cuff and push the paste toward the tip of the pastry bag. 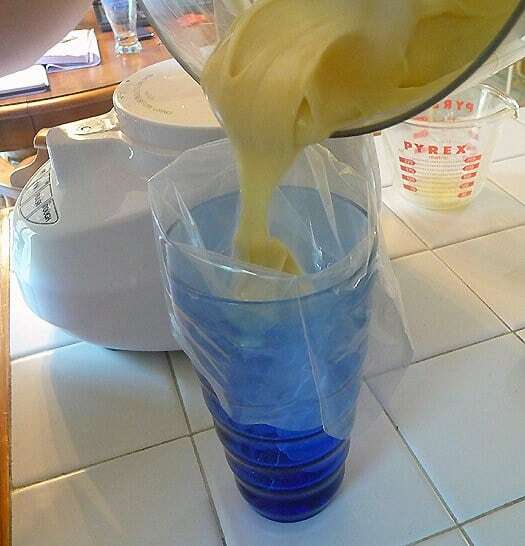 A Note on Filling a Pastry Bag: I have always found that using a tall glass to hold the pastry bag while I fill it with dough, icing, melted chocolate, etc. makes it much easier and less messy. 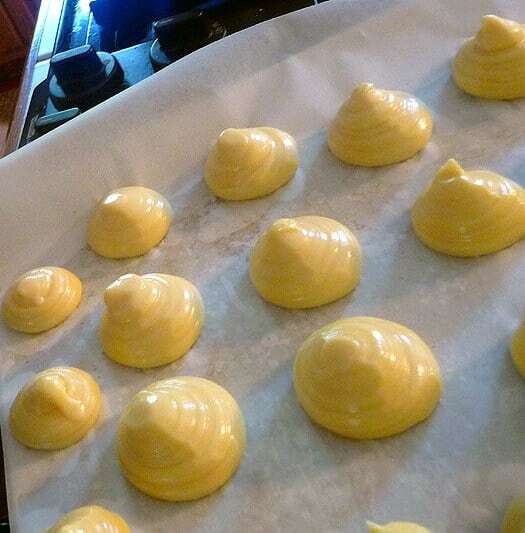 For cream puffs: Twist the top of the bag and pipe the paste into 1 1/4- to 1 1/2-inch mounds on the prepared baking sheet, spacing them about 1 to 1 1/4 inches apart. Use the back of a teaspoon dipped in a bowl of cold water to even out the shape and smooth the surface of the piped mounds. For éclairs: Twist the top of the bag and pipe the paste into eight 5 by 1-inch strips, spaced about 1 inch apart. Use the back of a teaspoon dipped in a bowl of cold water to even out the shape and smooth the surface of the piped strips. 6. 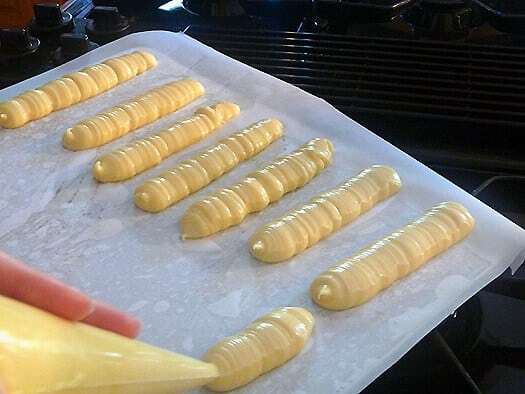 Bake 15 minutes (do not open the oven door), then reduce the oven temperature to 375 degrees and continue to bake until golden brown and fairly firm (the puffs and éclairs should not be soft and squishy), 8 to 10 minutes longer. Remove the baking sheet from the oven. With a paring knife, cut a 3/4-inch slit into the side of each puff and on the top of each éclair to release steam; return the puffs to the oven, turn off the oven, and prop the oven door open with the handle of a wooden spoon. For puffs: Use the tip of a paring knife to make a small X in the side of each puff, about halfway between the top and bottom. 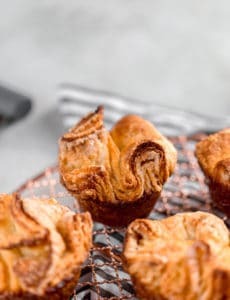 Fill a pastry bag fitted with a 1/4-inch plain tip with the pastry cream and then pip some pastry cream through the X in the side of each puff. (Fill each puff until the pastry cream starts to ooze out the side.) 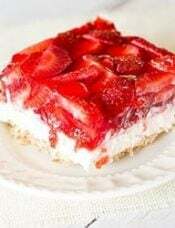 Top with chocolate glaze or sifted powdered sugar. Nice detail, and great pics. Thanks for sharing! Oh.My.Gosh…these are amazing! Thank you for the step by step directions! My daughter was having a French party at school and asked me to make something “French”. These profiteroles were perfect. I followed your directions and they came out perfect. I can’t wait for her to come home and tell me how they tasted! Thanks again for the tutorial! Very helpful and delicious looking. I will try this out over the weekend. 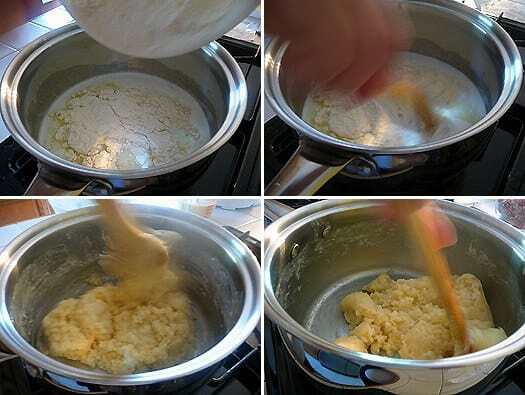 I have a question – in the recipe, it says you need a 1/2 a cup of eggs, but the pictures show you using a full cup. I was just wondering which one was correct? Hi Rebecca, 1/2 is correct, my apologies for the confusion, as I was doubling the recipe when I took the photos (I was a very novice blogger back then!). Wow…great demonstration and awesome tips. I think if i put my mind to it, even I could do it! 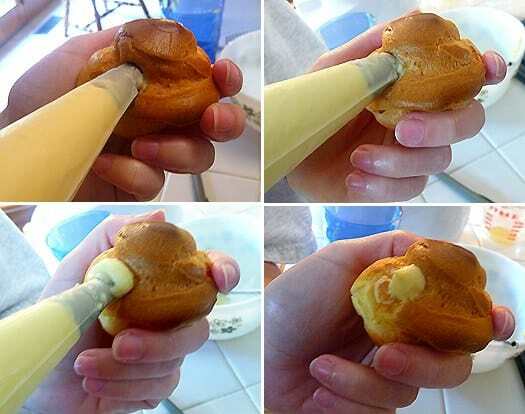 I was wondering if you can make a pate a choux, using only egg yolks! Hi Louise, There might be other recipes that only use egg yolks, I’m not sure. It is national chocolate eclair day tomorrow (June 22nd), and I’m using your fabulous recipes! Do you have a recipe for the chocolate glaze to use? Thanks! Wait…I just found the glaze recipe on your other post with the full eclair / pastry creme / glaze recipes! Thanks! At the moment i am on vacation and i have no access to a stand mixer food processor. How can i use a hand held mixer to make the shells? Hi Kelli, Unfortunately, I’m not sure how these would turn out with a hand mixer. The food processor really creates a smooth and silky dough. 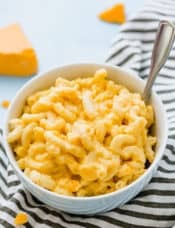 I tried your recipe today and it was a total success!!! im so happy! the first time i made Pate a Choux, turned into baked churros. THANK YOU soo much! It’s nearly midnight and I’ve now wasted 5,524 eggs trying to make eclairs for my dad’s birthday. Your advice just may have saved me. Thanks! For the puffs, should I just pump the dough straight or should I make a round movement while piping it on the plaque, as if to form a nest – sort of? Pipe the dough straight, not a nest. 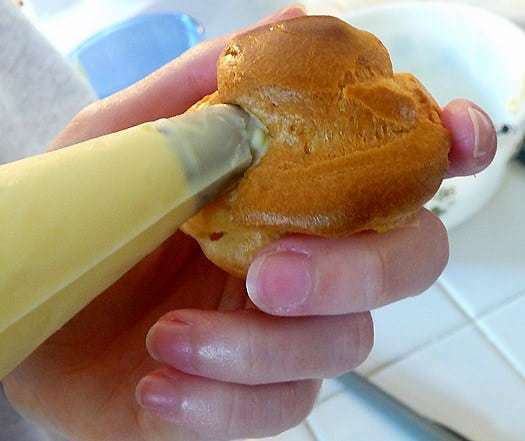 This pate a choux recipe did not work for me. I ‘volunteer test’ recipes for Cooks Illustrated and I tried this to the letter (weighed flour etc) and it was way too loose. The end result was flattened eclairs that I could not fill. I am now making the Joy of Cooking recipe (which has always worked) and noticed that you have twice the butter for the same amount of flour, which would only make more work for the eggs to get the dough to rise(?). It would also help to mention that overworking the flour with the low heat will cause the eclairs to collapse (as Joy of Cooking does). 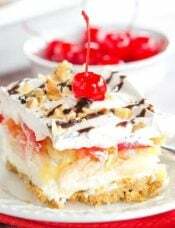 I just tried this recipe today and the pastry cream came out PERFECT!!! I was so nervous because I just started baking in general and I’m young and inexperienced, but I’m aspiring to become a great baker:) Thank you so much for this tutorial, it was really handy and detailed. BTW: I Love this site!!! This is a question. Can pate a chouz be made a day ahead? Hi Alexa, It really should be made the same day. 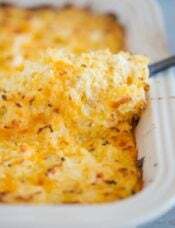 At the most, you can keep it at room temperature for a couple of hours (as indicated in the directions). You can freeze baked cream puffs though.